If you take the bus, or if you’ve even just seen a bus stop, you know that for the most part, they’re very practical affairs. There’s usually some kind of shelter, with maybe a bench and a Plexiglas shelter to (sort of) protect riders from the elements. For most cities, bus stops are constructed to be efficient, and nothing more. Still, bus stops are a major part of many people’s lives, getting them to and from where they need to go, and are especially important to people who don’t drive. So making a rather un-glamorous part of the day just a little brighter is actually a great way to bring a smile to so many faces, like these surprised bus commuters who got to have the best day ever at their bus stop. Then there are the bus stops along the 207 National Highway in Konagai, Japan, in the Nagasaki Prefecture. What makes them so special? Well, if you ever find yourself on the 207, you might start feeling a little hungry. That’s because 14 of the highway’s bus stops are shaped like giant fruits. Yes, that’s right. Giant, hollow fruits with bench seating inside, and even little windows so you can watch for the bus coming. Any morning commute is a little nice when it starts off inside a giant strawberry. Check them out below and learn the story of the giant fruit bus stops! 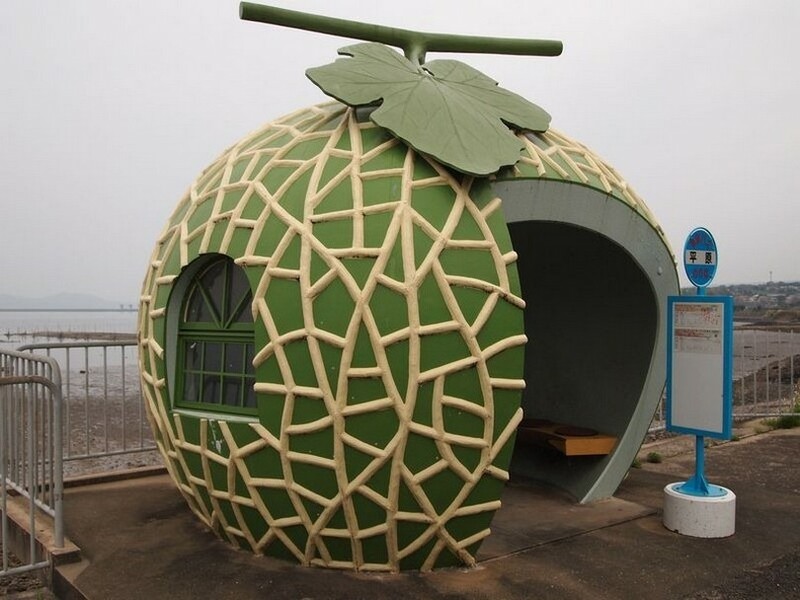 Along National Highway 207 in Konagai, Japan, the bus stops are built to look like enormous fruits. They’re hollow and equipped with seating and windows, and they’re an unexpectedly adorable addition to the otherwise very normal-looking road and town. The 14 bus stop structures are shaped like strawberries, watermelons, cantaloupes (also called muskmelons), oranges, and tomatoes. Tomatoes might seem like a strange choice, but they are technically fruit. The bus stops were constructed in 1990 for the Nagasaki Journey exhibition, part of a large travel expo held in and around the city of Osaka. The fair ran for six months and attracted some 23 million visitors. When the expo came to a close in September 1990, the fruit bust stops were left standing, and they remain today, looking as bright and cute as ever. There are 14 in total, although some sources say there may be two more. And they’re still used for their intended purpose nearly 30 years later. Inside, there’s a curved bench where commuters and travelers can wait for their bus, safe from the rain. Windows let in light that allow people to watch for their bus. The original expo’s theme was agriculture and gardening, hence the botanical theme. They also represent Nagasaki Prefecture’s main agricultural products. They’ve been rendered in pretty good detail, too, and are complete with leaves and stems. During the days of the expo, the bus stops were a small attraction, and mainly served to funnel tourists down to the coast where they could see more attractions. But since then, they’ve become attractions in their own right, and have been a beloved fixture for commuters in Konagai and nearby Isahaya. And it seems they’ve even inspired some fashion! These bus stops show that just because something is functional, it doesn’t mean it can’t be cute at the same time. Would you like to add some cheer to your town with creative bus stops? Let us know in the comments below! Please SHARE if these fruit stations brought a smile to your day!